We worked with First Community Bank in Batesville to design a separate website for their Dealer Direct department. With the new website, visitors can check rates, use an online loan calculator, and fill out a consumer application. 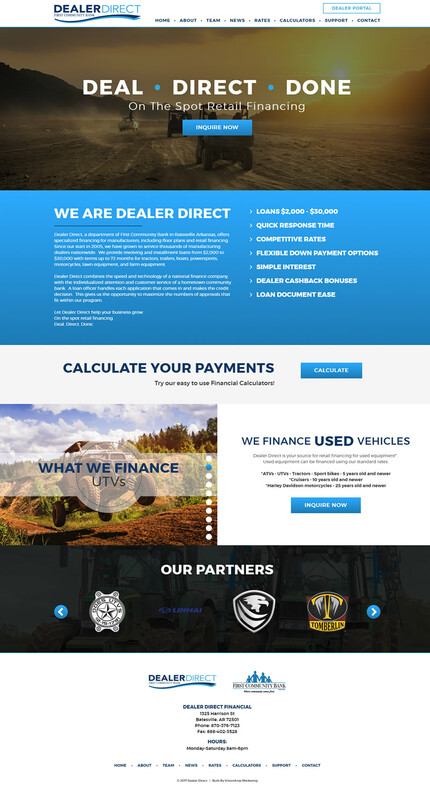 The new mobile-friendly site also has a Dealer Portal for dealers to be able to sign-in directly and view account information. A seamless navigation, bold color scheme, and features all work together to create a professional, eye-catching site. Dealer Direct, a department of First Community Bank in Batesville, Arkansas, offers specialized financing for manufacturers, including floor plans and retail financing.